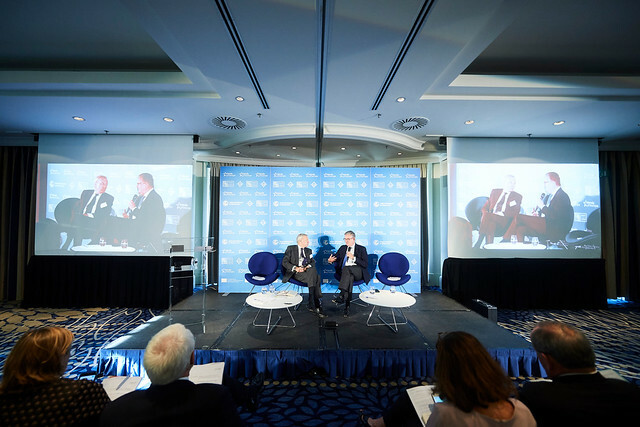 Friends of Europe’s annual Policy Security Summit is the flagship event of our ambitious peace, security & defence programme. Bringing together senior decision-makers with out-of-the-box movers and shakers, this occasion allows for in-depth and innovative discussions on today’s most pressing security and defence issues. Taking place right after the 2018 NATO Summit and ahead of the 70th anniversary of NATO, this year’s summit is particularly timely to launch and promote new visionary ideas on the future of NATO, European defence and security, and current security developments shaking our world. The summit will present and discuss the recommendations of our Debating Security Plus (DS+) online brainstorm that took place on 19-20 June. Gathering a unique coalition of over a thousand participants from around the world, it is the only platform that permits a truly global whole-of-society consultation providing fresh and innovative recommendations to global security challenges. The conference will also allow participants to take part in early bird-masterclasses to learn more about key conflicts and crises from high-level experts, including Elham Saudi, Director of Lawyers for Justice in Libya; Iryna Brunova-Kalisetska, Executive Director of the Integration and Development Center for Information and Research, Ukraine; and Zaina Erhaim, award-winning Syrian journalist. It is a unique opportunity to look at some of Europe’s biggest foreign policy challenges with a select group of stakeholders and seek to learn both from conflicts and crises and their resolution. During Friends of Europe’s recent global online brainstorm, Debating Security Plus, there were repeated calls for Europe to speed up its steps towards strategic autonomy, strengthening a common EU strategic approach to foreign, defence and security policy. Continuing conflicts in its eastern and southern neighbourhood - and beyond – are challenging Europe’s capacity to act collectively to shape global events. Will new security and defence capabilities currently being developed allow the EU to respond more effectively to external conflicts and crises and play a greater role in fostering peace? To the South, what can be done to stop the agenda being dominated by migration and security concerns and foster a longer-term approach to stability, security and prosperity in the region? To the East, should the EU play a bigger role in conflict resolution processes in the numerous ‘frozen conflicts’ of the post-Soviet space, including in Georgia, Ukraine and Moldova? Further afield, can the European Union assist in the peace process and denuclearisation of the Korean Peninsula? This set of parallel masterclasses will look at some of Europe’s biggest foreign policy challenges, seeking to learn both from conflicts and crises and their resolution. The European Union is wrestling with an array of old and new security challenges as it seeks to tackle rapid technological developments from Artificial Intelligence to robotics which are changing the global military and security landscape and the nature of warfare. New EU moves to develop defence capabilities, including the Coordinated Annual Review on Defence (CARD), the Permanent Structured Cooperation (PESCO) and the European Defence Fund (EDF) are central pieces of a new political and institutional jigsaw puzzle which has the potential to provide EU nations with better and more interoperable defense capabilities to address a multiplicity of threats. The international community has raised concerns over the lack of human control in modern warfare. Where do we draw the line on autonomy and warfare? Are the new European security and defence capabilities, along with revamped NATO structures, adapted to the different security threats we face? Has Europe already lost the ‘arms race’ for the use of artificial intelligence (AI) and robotics for defence applications? Would an international code of conduct or international agreement based on those developed on nuclear or chemical weapons, as advocated during the DS+ online brainstorm, help regulate the military use of AI and mitigate its disruptive effects? NATO unity is being tested by US President Donald Trump’s stepped-up demands for an increase in European defence spending and his apparent preference for bilateral security arrangements over joint Alliance operations. The Debating Security Plus online brainstorm argued that European nations need to boost defence spending at least to the NATO target of 2% of GDP but should keep in mind that spending more is not enough; how they spend their defence budgets is key. As highlighted by the NATO summit in July, the Alliance also continues to juggle its long-standing commitments to theatres like Afghanistan, increased tensions with Russia and counter-terrorism efforts with new and increasingly sophisticated threats posed by hybrid warfare as well as cyber-attacks which threaten to disrupt crucial infrastructure, businesses, and privacy. As it nears its 70th anniversary, NATO is under pressure to transform an old Alliance into a more modern and efficient organisation ready to take up new challenges in a fast-changing security landscape. What changes does NATO need to embrace to be able to meet the security and defence challenges of the 21st century, including relations with China? How does NATO see European efforts to build closer defence cooperation, and what can be done to make sure NATO and EU efforts reinforce each other? How should EU member states and NATO allies adapt to the threat of a less internationally engaged US? As Norwegian Minister of Defence, Frank Bakke-Jensen plays a crucial role in current preparations for the country’s hosting of one of NATO’s biggest exercises in decades, with some 40,000 forces expected to arrive in the country in October-November. A key Norwegian politician, Bakke-Jensen previously served as Minister of EEA and EU Affairs. He has been a member of the Norwegian Parliament since 2009, and previously served as Mayor of Båtsfjord. Before entering politics, he was the Managing Director of the Båtsfjord Travel Agency and has served in the UN Interim Force in Lebanon from 1990-1991. An award-winning foreign policy and security researcher, Benedetta Berti currently leads policy plan-ning work in the NATO Secretary-General’s private office. An Eisenhower Global Fellow and a TED Sen-ior Fellow, Berti has held positions at Harvard University, West Point, the Institute for National Security Studies and the Foreign Policy Research Institute, among others. Her work focuses on armed groups and internal wars, analysing the impact of insecurity on civilians and studying how to build more peace-ful and resilient communities. Her research has appeared, among others, in Al-Jazeera, Foreign Policy, Foreign Affairs, the Wall Street Journal and The New York Times. Iryna is a Ukrainian civic activist and political expert with more than 15 years of research and teaching experience in identity-based conflicts. Originally from Crimea, she was an outspoken critic of Russian annexation and fled the region to avoid arrest, taking refuge in Kiev. She currently runs the Integration and Development Center for Information and Research, a non-governmental organisation, which focuses on training government officials and journalists in diversity management, on misconceptions and on stereotypes. Zaina Erhaim has reported extensively on the Syrian revolution, and was among the few female journalists reporting from within the country. Erhaim was named the 2015 journalist of the year by Reporters without Borders, and one of the 100 Most Powerful Arab Women by Arabian Business in 2016. She has also received the first Annita Ausuburg Award for Rebel Woman Against the War of the Women International League for Peace and Freedom. Currently a Senior Media Specialist at the Institute for War and Peace Reporting, she has trained hundreds of people to be citizen reporters, especially women. In her current position, Lowri Evans is instrumental in the development of the European Defence Fund and other initiatives to support European industrial cooperation in defence research and the joint funding of defence capabilities, and provide a strong industrial base for the EU’s common security and defence policy (CSDP). With over 30 years of experience at the Commission, Evans has worked in several policy areas, notably in maritime affairs and fisheries, competition and employment. She started her professional career in audit and accountancy with Deloitte. In his current role, Edvinas Kerza is responsible for the Baltic state’s national cybersecurity policy and is spearheading Lithuania’s PESCO project to set up EU Cyber Rapid Response Force teams. An IT professional and an expert in all things cyber, Kerza was previously in charge of managing key information systems projects at the Ministry of Foreign Affairs of Lithuania, and has participated in several international conferences on this subject. Kerza also previously served as Chief Specialist at the Lithuanian Permanent Representation to the European Union. An expert in Korean politics, society, culture and economy, Youngmi Kim has focused her research on comparative politics, including the study of political parties, party systems and governability, and comparative regionalism. Prior to her position at the University of Edinburgh, she worked as an Associate Professor of international relations and public policy at the Central European University, where she directed the Global E-School in Eurasia, a large multi-country online education programme in Korean Studies. Her current research explores the rise of polarisation, inequality and political contention in South Korea and online political participation, activism and populism in Asia's democracies. A British diplomat with more than 30 years of experience at the Foreign and Commonwealth Office, Julian King previously served as the UK’s Permanent Representative to the EU Political and Security Committee, Ambassador to France and Ireland, and Director General of the Northern Ireland Office. In his current position as European Commissioner for the Security Union, King has been responsible for steering the EU’s anti-terrorism strategy, building a sustainable Security Union, and strengthening the EU’s joint response to security threats including organised crime, radicalisation, terrorist propaganda and cybercrime. Helen Lackner has worked across Yemen since the 1970s and has written extensively about the country’s political economy as well as its social and economic issues, and now focuses on trying to promote equitable development and peace. She has also worked as a consultant in social aspects of rural development for four decades, mostly in the Middle East, Africa and Europe. Her most recent publications include ‘Yemen’s peaceful transition from autocracy: could it have succeeded?’ and ‘Understanding the Yemeni crisis: the transformation of tribal roles in recent decades’. Elham Saudi has been actively working on investigating human rights violations in Libya since 2011. She has advised a number of Libyan, European and international bodies in relation to the conflict in Libya, including the National Transitional Council in Libya on a number of matters of international law, including drafting of its guidelines for opposition fighting, and is also an Associate Fellow at Chatham House. She is a regular commentator on the situation in Libya on the BBC, Radio 4, Channel 4 News, and Al Jazeera. An expert on the nexus of technology, society and security, Frank Sauer is Head of Research of the METIS Project, a pilot project focusing on strategically relevant questions of international politics and interlinking academic inquiry and policy practice. Sauer is also a member of the International Committee for Robot Arms Control and the International Panel on the Regulation of Autonomous Weapons. His research focuses on nuclear issues, terrorism, cyber security as well as the military application of artificial intelligence (AI) and robotics. In addition to coordinating the Campaign to Stop Killer Robots, an international coalition of NGOs working to preemptively ban fully autonomous weapons, Mary Wareham is the Arms Division Advocacy Director at Human Rights Watch, leading advocacy against weapons posing a significant threat to civilians. She previously served as Advocacy Director for Oxfam New Zealand, leading efforts to secure an arms trade treaty and the 2008 Convention on Cluster Munitions, and also worked for the Vietnam Veterans of America Foundation, assisting Jody Williams in coordinating the International Campaign to Ban Landmines (ICBL), which received the 1997 Nobel Peace Prize.